Railings aren’t just for outdoor design. They fit in well indoors too, and can completely change a space. Interior railings on balcony and stair are often the architectural highlight of a room! 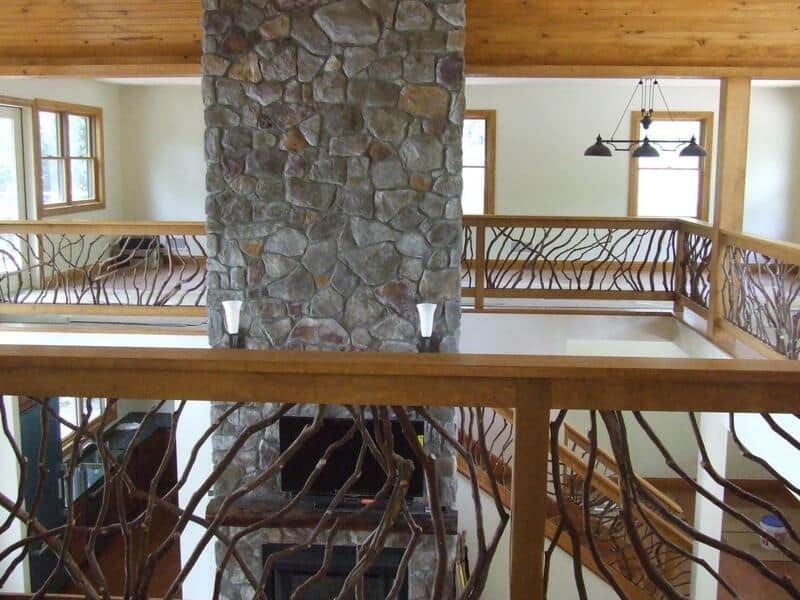 For creative and unique indoor railings, Mountain Laurel Handrails has got you covered. 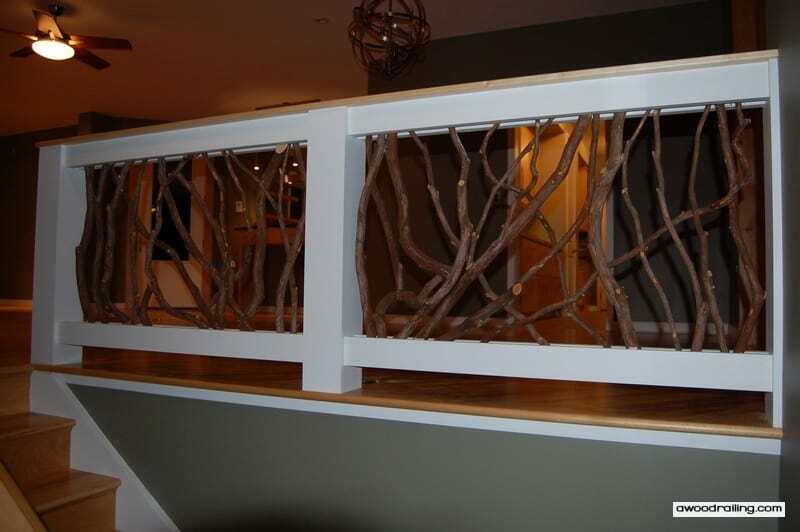 These custom crafted works of art are an interior wood railing idea unlike any other. They instantly become the focal point of any home with an exposed stair guardrail. Their purpose doesn’t stop there; when they’re installed up high, you can admire them from below! When choosing decorating accents for the interior of your home, it’s important to pick the style that best matches its already existing design elements. 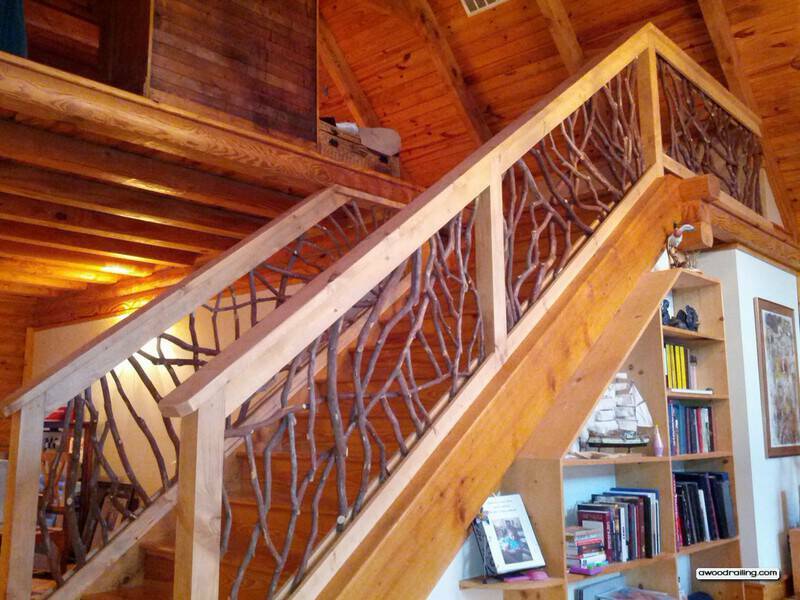 A custom interior stair railing made of woven branches fits in very nicely with a rustic themed home. There’s nothing quite like real wood to lend a certain character to any project, and that’s just what we offer. Not only do these top-quality products bring life to your home, but you can also be sure that installation of these handrails is a simple and easy process. This easy-to-install interior railing system is custom built to your measurements and most handrail designs can be installed in just a day. Choosing one of all the handrail designs for your home can be a challenging process. The owners of this home wanted to add a unique element to their great room. Mountain Laurel Handrail is the perfect accent for this application! The large sliding glass door lets in light and views of the outdoors, and the branch railing continues the line of sight from the outside with the organic shapes of the forest. 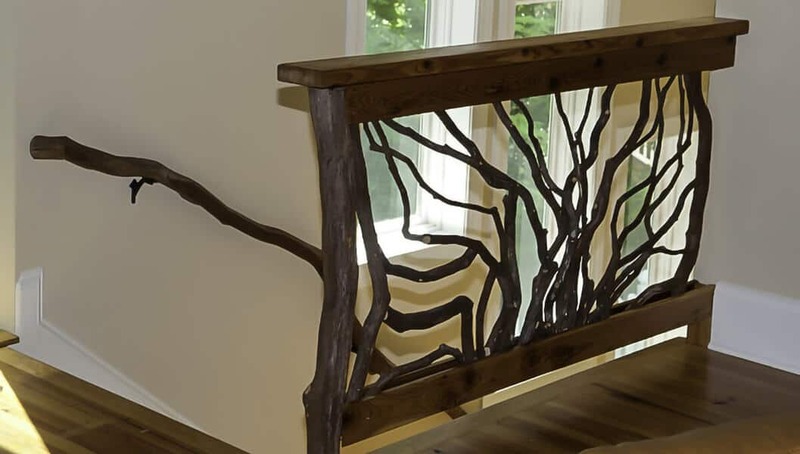 Each of these interior handrail designs is unique and totally unlike any other since the sticks and branches lend unique characteristics and style to the piece. The homeowners opted to leave the cedar unfinished to provide a nice contrast to the existing painted drywall and white cabinetry. The lines of these railings add excitement to the aesthetic of the space and make a lovely foil to the other elements of the room. The couch with nice view of the fireplace, looks like a great place to relax, read a book and enjoy the afternoon sunshine! Many homes now have large great rooms with fireplaces and open kitchens so that family and friends can gather together in a larger, more open area. 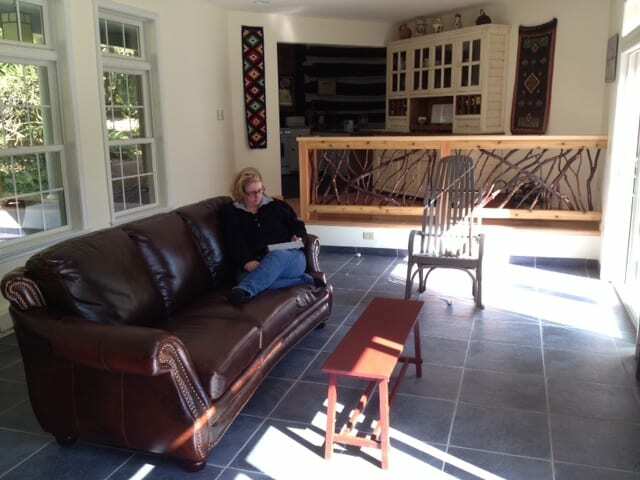 Gone are the days of formal dining rooms and separate living rooms. In homes like these, it is especially important to have a beautiful interior handrail. No brand makes handrails that better fit these rooms than us. Your home, and especially the large rooms where your friends and family gather, should feel comfortable, natural, and add that cozy and homey touch to your home. 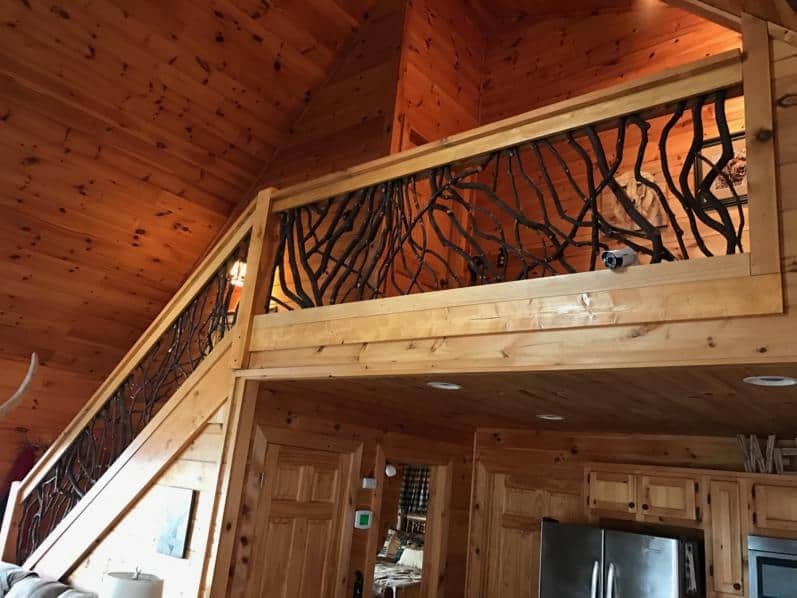 Many of these interior stair railings will be in direct view of people gathering in the great room so make sure to choose the best to impress by choosing Mountain Laurel Handrails! Contact today to get started. If you thought railings were only for outdoor décor, think again! You can easily update an entire room’s look simply by adding handrails to the space, on stairs and balconies. 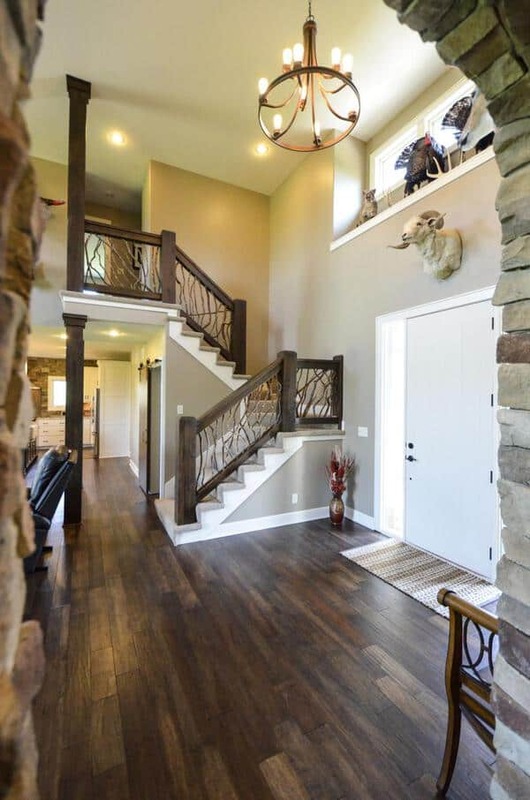 Mountain Laurel Handrails are great on the interior of the home! They are the focal point of any grand home with an exposed stair railing or indoor balcony. The handrail design can also be adapted for furniture, allowing your entire home to have a natural wood look. 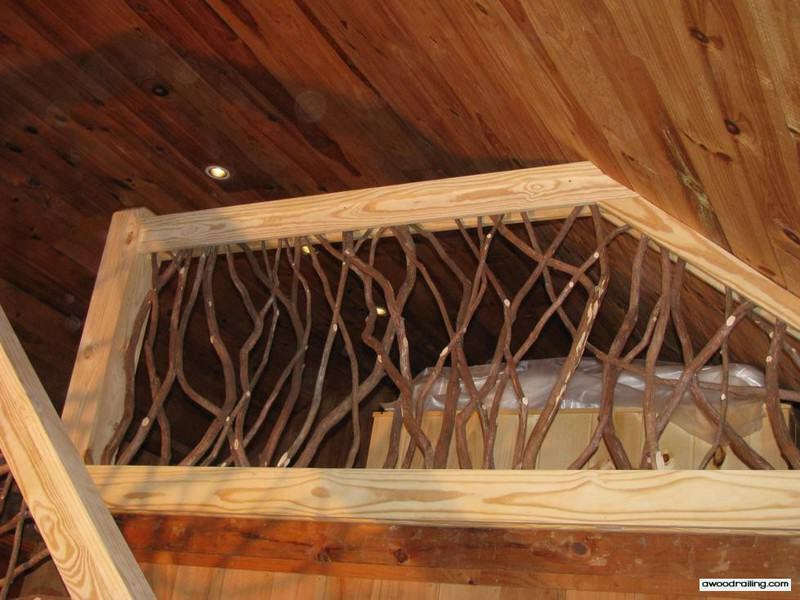 We can make tables, chairs, headboards, room dividers and screens, magazine racks, just about any piece of interior furniture can be made better with woven branches!Let your interior design imagination run wild, and create your perfect home from handrails to furniture. When investing in such an important interior update as handrails, it’s important to do your research and really understand what you’re getting. Interior railings come in many different forms. The most basic handrail, seen on just about every house, is made of 2×2 pickets running straight up and down. The visual effect of this look is equivalent to bars on a window. While a technically effective handrail, this design is simple and forgettable. This pattern really does nothing to enhance the view from your deck or the way it appears to onlookers. There are some interesting geometric patterns that can be made with lumber. Some companies step up their game by going one step further and creating geometric shapes and patters with the lumber. But no square shape can compare to the beauty of the organic and wondrous forms made by woven branches. Mountain Laurel Handrails are crafted by skilled carpenters who are well-versed in combining disparate pieces into a cohesive whole. The handrail sections pictured about arrive as an easy to install railing kit. Sections are built to custom measurements and each order is unique. When they arrive, simply trim the ends of the sections and slide them into place. Screws are the suggested fastener for securing the interior railings to the posts. 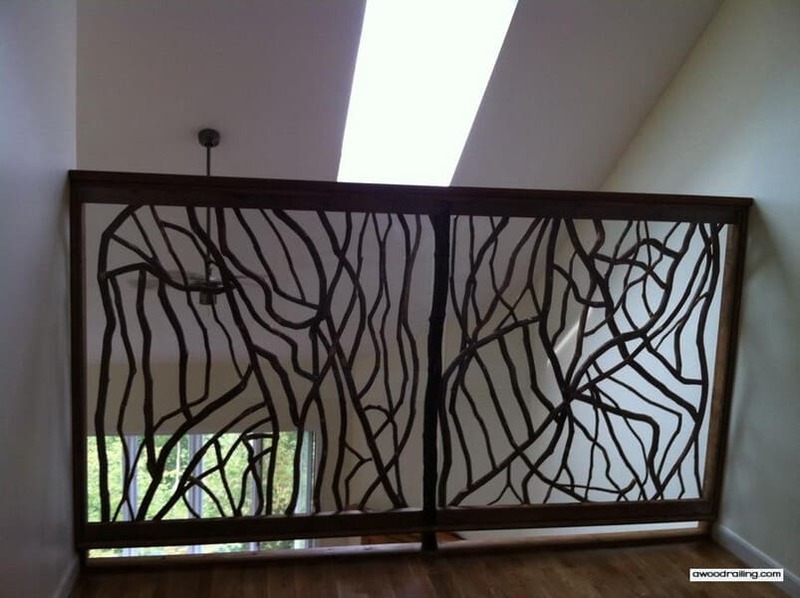 These railings endow any home with incomparable and utterly unique works of art! If you are building a timber frame home or log cabin, and are planning on lots of natural elements, most, if not all, of your design elements are going to be made of wood. There is no style of handrail that is even remotely comparable to the natural elegance of these intricate wood patterns. These custom handrails are all custom built and Made in the USA. Enhance the style and decor of your home with the unmatched grace of these handrails. Your beautiful and unique home deserves handrails and furniture that are equally as beautiful and unique. Nothing beats the comfortable, natural feel of these beautiful hand-crafted pieces. These beautiful interior railing kits are the focal point of this home. Many homes feature a great room with a stair case and these stair railings and balcony handrails are often the dominant architectural element in the interior. Many places will feature the regular, run of the mill style with evenly spaced vertical placed pieces of wood making up the guard rail. But there are so many other choices that one of the best places to start is by looking at interior railing pictures. From a quick internet search, you’d think that all interior railings are made of wrought iron, but there’s so many more options. Metal is a good choice as it is durable and long lasting. But in many regards it’s also very limited. How many different colors does a wrought iron handrail come in? Not very many, as you’re pretty much limited to whatever color the metal is and wrought iron is generally black. So the first limitation is color. Another limitation is that this kind of handrail can be extremely expensive for a custom design. It’s due to the nature of metal being difficult to work, requiring extreme heat, special tools and protective equipment. Metal is also an expensive raw material though many times it is recycled, which is a green plus. An interior stair railing made of glass is another option. Glass is a great material to combine with other materials. Due to its transparent nature, it can be used to highlight and accentuate other features that might ordinarily be overlooked. Glass works well with steel framing and with wood railing and is a good choice for a material palette. Interior wood railing does not have to be limited to the same, boring, repetitive pattern. Even with fancy turned balusters, many wood stairs railing still fall into the same design trap of the vertical repeat. 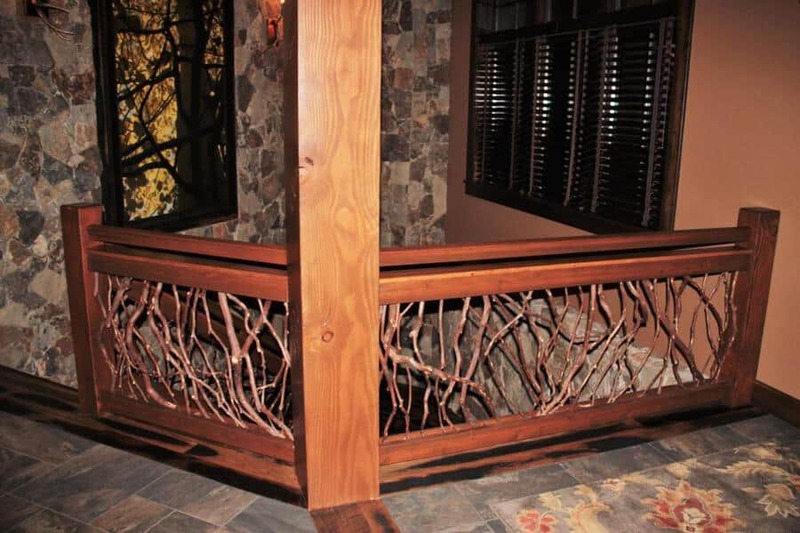 Mountain Laurel Handrail is a gorgeous choice for your interior handrail. This creative style is made from branches woven together to create intricate shapes, of which no two are ever exactly alike. Since each tree grows into a unique form, the repetition between handrail sections is eliminated and what emerges is a resplendent beauty.